For your next visit to Porto, Portugal, why not consider booking a walking tour of the city or a guided tour of some of the wonderful places of interest nearby. Porto – City Center Tours: This beautiful riverfront city is full of old world charm and offers visitors more than just a great glass of wine. Take a tour of the city and discover the beauty of its riverfront, the history of its monuments, and the enchantment of its ancient narrow streets and alleyways. For a selection of tours, click here. 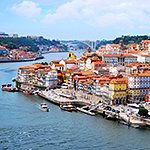 Porto – Day Trip Tours: Explore the beauty, lush countryside and historic towns of Portugal’s North and Central regions. Take a step back in time and discover the history and cultural significance of towns such as Braga, Guimãraes, Coimbra, Aveiro and Fátima. For a selection of tours, click here. Porto – Wine Tours: Go beyond the wine cellars in Porto to visit the picturesque river valleys of the Minho region and the quintas (estates) where the wines are produced. Discover some of the region’s historic towns and visit a Port wine estate to enjoy a wine tasting. For a selection of tours, click here.